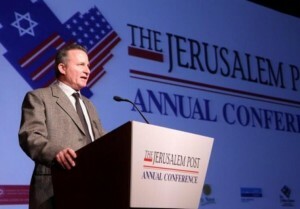 Jerusalem Post Editor Steve Linde addresses the Conference. New York, NY — June 5, 2015 … US Secretary of the Treasury Jacob J. Lew and Congresswoman Nita Lowey will be among several US and Israeli dignitaries addressing The Jerusalem Post’s fourth Annual Conference. The Conference is scheduled to start on the morning of Sunday, June 7. Israeli and American elected officials, security experts and media analysts will examine the potential Iran nuclear agreement, the future of the US-Israel relationship, and the rise of global anti-Semitism. US Rep. Lowey, the ranking member of the House Appropriations Committee and a veteran Jewish congresswoman, will also speak to the 1,500 conference attendees from across the American Jewish community gathering under the banner of “Challenges Facing The New Israeli Government,” at the Marriott Marquis Hotel in Times Square. Confirmed speakers for the daylong program include: former New York Mayor Rudy Giuliani, Senator Bob Menendez, Likud MK Yuval Steinitz, Yesh Atid Chairman Yair Lapid, former IDF Chief of Staff Gabi Ashkenazi, former Mossad Director Meir Dagan, Israel’s Permanent Representative to the United Nations Ron Prosor, former Israel National Security Advisor Giora Eiland, World Jewish Congress President Ronald Lauder, and Jewish Agency Chairman Natan Sharansky. A full conference schedule is available here. “This is a wonderful opportunity for American Jewish leaders to hear firsthand about the burning issues facing the State of Israel and world Jewry,” said Ronit Hasin-Hochman, CEO of The Jerusalem Post. As part of the conference, Gabi Ashkenazi, Meir Dagan and Giora Eiland will join Jerusalem Post senior contributing editor Caroline Glick for a panel on security threats facing the State of Israel. In addition, the president of the conference, World Jewish Congress President Ronald Lauder, will hold a special session on the rise of anti-Semitism and the spread of radical Islam throughout the world. Also as part of the conference, The Jerusalem Post and Limmud FSU will open a special photographic exhibition marking 25 years since the former USSR allowed Soviet Jews to emigrate. The exhibit traces the story of contemporary Russian Jews and contains 50 photographs from The Jerusalem Post’s archives, Israel Government Press Office, and a number of prominent photographers, including Robert A. Cumins, who have documented these historical moments. Click here to view a sample of the photos that will be featured as part of the new exhibit.